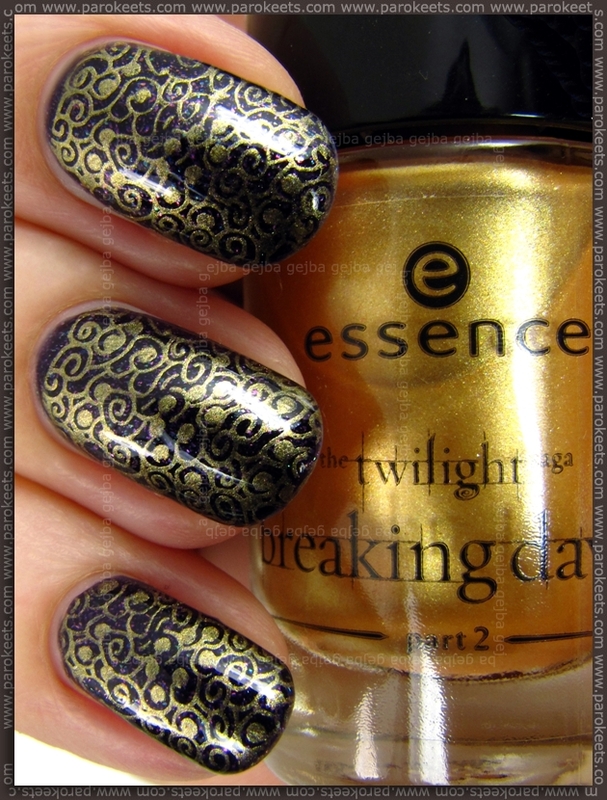 Let’s see if Essence Breaking Dawn trend edition products are as good as on preview photos. 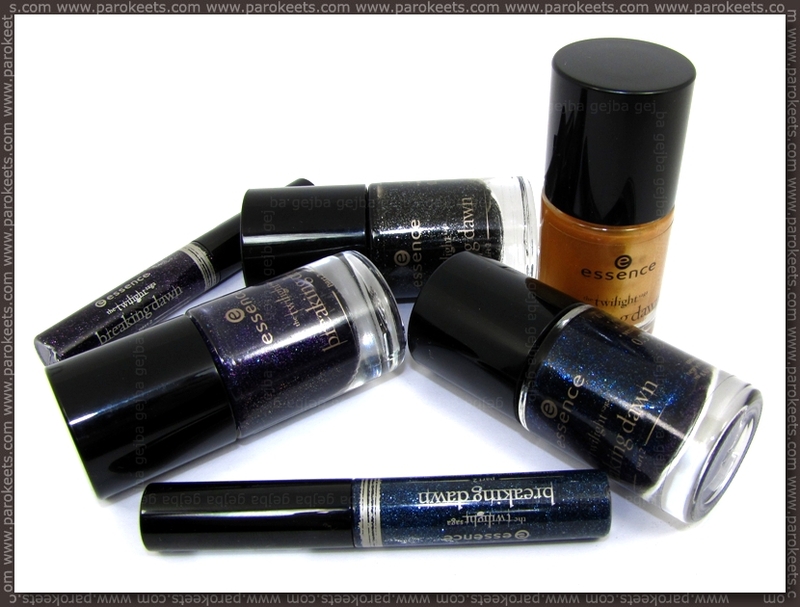 Today I have for you swatches of all 4 nail polishes and two liquid eyeliners. As expected blue and purple nail polishes are my darlings. 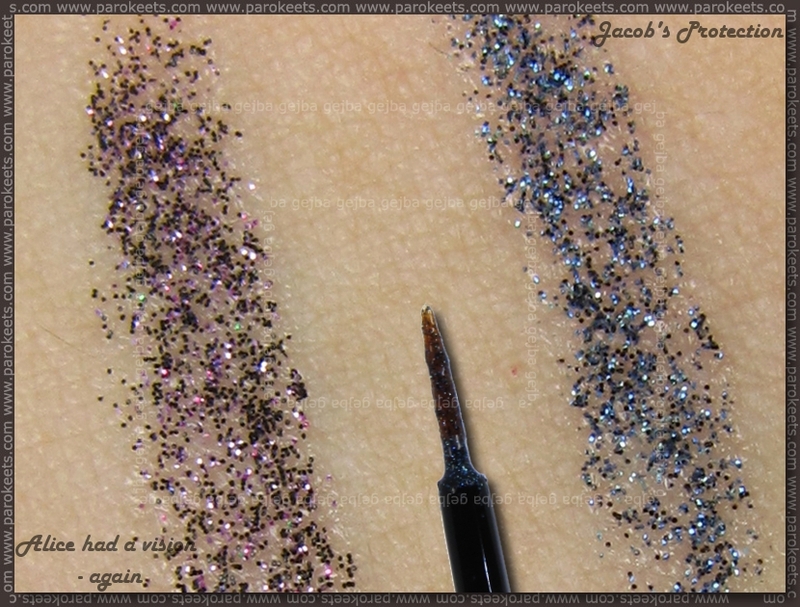 Together with black one they come in similar formula – quite thick and loaded with lots of tiny flake glitter. I had to apply all of them in two thicker coats and then apply 2 coats of top coat to get the shine I wanted. They look seriously pretty, but drying time was not as fast as I’m used to. Essence Jacob’s Protection is the most complex and “have to have” nail polish in my book. Base is darker blue and sparkles from within in blue, purple, green tones. Close behind is Essence Alice Had A Vision – Again. Another dark shade with multicolored/duochrome flakies, but this time suspended in dark purple base. Both nail polishes are almost vampy shades but with a serious punch. Almost black base with loads of primarily silver flakies but green and pink shimmer is also there. Now if they added holo flakies I would be floored by this nail polish, this way it’s OK, but nothing spectacular. Essence A Piece Of Forever didn’t look appealing on promotional photographs and I did not fall in love with it in real life either. It’s gold, streaky and well … yellow gold. But it has one major selling point – it’s GREAT for stamping (I used one of the new Essence image plates). Liquid eyeliners fulfill the promise of thin brush. I had no real trouble applying them and as they have sheer base I guess that is given. :D Each one is loaded with shimmery/glittery particles that give really nice shine, but I would still prefer if the base matched the color of the glitter as I’m one of the lazy ones (I first apply colored eyeliner and they shimmery one). I wore them for few hours and in that time they did not budge, but were easy to remove with my micellar solution. I used 2 layers on swatch. I still have pigments and blush on my WL … will see how they look in reality and then buy few more goodies. Tell me – now that you have seen swatches – are still the same nail polish shades on your WL? *I received eyeliners for review and bought the nail polishes. Previous articleShoes: Dr. Martens, my love! Kakav je na oko Edward’s Love u poređenju sa baznim delom Ticket to the Show? I like the liners too. I love Jacob’s protection and alice had a vision – again will definitely have to grab a back up for those ones! Thanks so much for holding this! Alice Had A Vision is beautiful! i simply love jacob’s protection (much prettier than edward’s love – i’m totally team jacob, when these polishes are concerned) and alice had a vision. These look awesome- my fave among them is definitely A piece of forever! I’d like to have either Jacob’s protection or Alice’s one. Thank you very much for the giveaway! I would really love to win because the colors are very beautiful! I would really love to win because the colors are just awesome! Vijoličen lak je čudovit :wub: . Nad črtali sem pa kar malo razočarana, lepši in vsaj zame bolj uporabni bi bili z barvno bazo. Oh my! The collection is gorgeous, I would love to have some of these, my favorite is the Essence Breaking Dawn – Alice Had A Vision-Again nail polish swatch. The polishes are so gorgeous, especially Jacob’s Protection! I wish I could buy these in Canada. Thanks for doing a giveaway! :biggrin: I agree that someone on Essence team likes Jacob more than Edward, Jacob’s Protection is super pretty and definitely a must-have! Thanks for the giveaway dolls! that purple is gorgeous !! Love this giveaway. Can’t get the polishes here. I like it but Vampire’s love collection impressed me more. Ampak mislim, da mi Edward’s Love top. I love Breaking dawn!!! This limited edition collection hasn’t arrived yet here in Italy!! Thank you for the giveaway! the swatches are lovely. Nice colors, even if I hate Twilight saga! p.s. I did a mistake with my last comment, I’m writing from my sister’s computer and there was her e mail address.. And I don’t know how to remove it! Hope it’s not a problem! 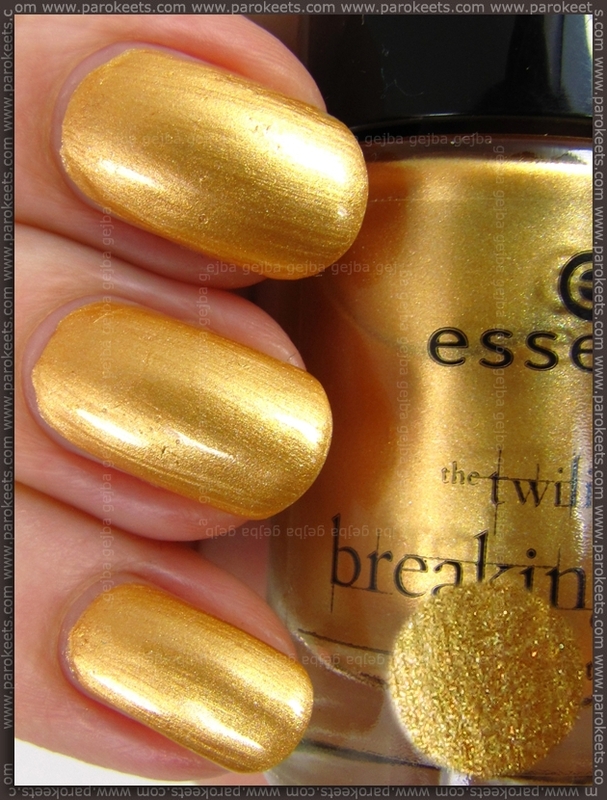 I hate Twilight saga, but these are very nice polishes! I’ve seen a lot of these colors for this autumn/winter! I really need Alice Had A Vision – Again! These prizes are simply fabulous!!! Thanks for the wonderful giveaway, I must have this collection! i’m not in love with the yellow gold polish, but the other polishes are so beautiful! I was quite excited about a couple polishes from this collection, obviously the dark ones so I’m super happy about finding good swatches. LOL for “team Jacob” vs “team Edward”. 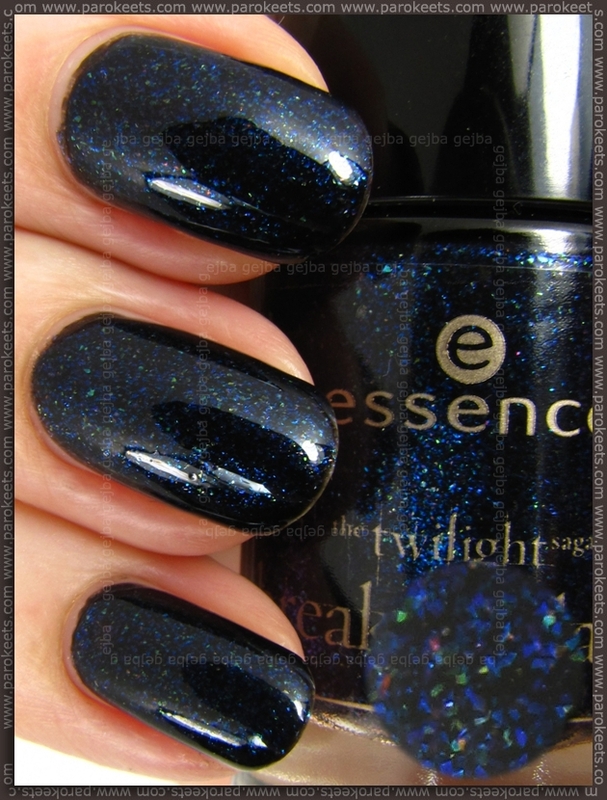 Actually the black + silver flakies is not a very original polish (last Vampire’s Love from Essence had one, practically the same of a Colour&Go). I’ve just seen this collection in store and took the 4 polishes, they look stunning!! and that’s great that A Piece Of Forever works for stamping! thanks for the idea!! <3 I also took the red gloss and I love it so much!! I hesitate for the blush but I'll probably go again and grab it. It didn't seem shimmery. Lakovi su mi jako lijepi! Count me in for the giveaway! Your stores seem to be the first in getting the new LEs. I don’t think we’ll get that anytime soon. Don’t like the gold polish very much but it definitely rocks as a stamping polish! Thanks for the lovely giveaway and good luck to everyone. I cant wait to get this trend edition here in Austria. I love the dark colors of the nail polishes. I love Alice Had A Vision, great color! Jacob’s Protection looks awesome, I want it :happy: , thanks for the giveaway. Mislim, da si bom nabavila ta dva + mogoče kakšen pigment, če mi bo všeč. I like this purple one. I bought one nail polish from previous collection, but I wasnt very satisfied. Hope these are better. Alice is stunning and Jacob is just gorgeous :yes: . vijolčnega moram dobiti. :) spet ste pripravile super giveaway. I still believe the darkest are the ones I want (Alice and Jacob). Gold looks awful on me so I already knew I would have passed it. What about Edward? I think I need to see the bottle IRL to decide about it. I’m not really amazed by it right now. I must say I am not a flakie lover anyway. Last year’s collection was much better IMHO! i can’t wait to see them in real life! kok so čudoviti! upam da pridejo! It’s so sad that we don’t get TE’s over here. The blue one is to die for! Thank you for a great giveaway!